Local schoolgirl, Harriet (Hattie) Foster is planning a volunteering trip to Nakuru, Kenya next year, along with a group of her school-friends. While there, they will be building and teaching at a school which provides an education for children in deprived areas, working alongside a community project organised through the charity African Adventures. 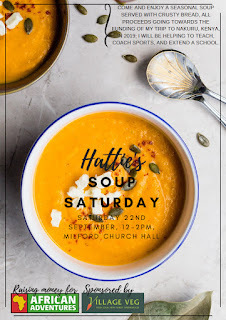 Hattie is now in the process of fundraising for the trip, and one event she has organised is a 'Soup Saturday' on Saturday 22nd September 2018. There will also be a vegetable-themed raffle. She has already has support from our local greengrocers, Village Veg to kick her fundraising off, and if you can pop down to All Saints' Church Hall on the 22nd September between 12noon and 2pm you can enjoy a tasty bowl of soup with crusty bread all for any donation you wish to give, anything given will help Hattie towards hitting her target.